We’ve all heard about Snowboarding and skiing, they are popular and during the winter months slopes are packed with people engaging in these intense winter sports. Children will actually benefit from this sport more than adults mainly because kids compare this to tubing or sledding. Airboarding was just introduced to the United States recently. It started in Europe recently and already a few resorts around the country are allowing this snow sport. I love to snowboard and it’s one of the more popular slope sports that really get your adrenaline going but will airboarding be as popular as snowboarding? It’s not likely because this will benefit the younger generation more I think, but it will still be a great family hobby and plenty of people will look at this as a more extreme form of sledding. One thing that makes airboarding a bit different then sleigh riding and sledding is its increasingly high demand to make certain boards and accessories for the sport. According to a website on the net, most press thinks it is going to be a small niche market, possibly medium sized, and will attract children and their families at most. Remember Razor scooters, they attracted so much hype and became the number one fad for the longest time. Well… I believe this will be a lot like that except more popular, because it will take place in the winter and during the offseason people won’t be as involved, this will then get them pumped for the next winter. A few of the models that have already been released in the USA are a child’s version priced at about $149.00, most of the children’s models will be priced at this amount. The Airboard Classic which is a bit more advanced for older users will be about $269.00. Many people are going to enjoy this sport because it doesn’t take a rocket scientist to figure out. I also believe there won’t be as many injuries as snowboarding and skiing, while tricks will be possible, they won’t be as intense. I can only imagine what type of tricks can be performed on an airboard but with evolution one can never tell what will be invented. Once summer is here winter is right around the corner, after getting through the fall of course. One thing that will be on everyone’s mind is the slopes and how much fun it is to race down those steep hills. 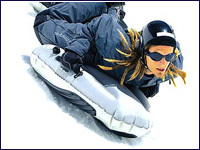 Many slopes in America don’t allow tubing or sledding down there hills mainly because they feel it would be dangerous, but with Airboarding they are. This is the only inclination why this might be a popular winter sport, but I won’t go any further with that. Overall I think I will enjoy this activity a lot. It’s not too dangerous but it uses enough adrenaline to pump your blood. I on the other hand enjoy danger but Airboarding is just right for any age group interested in hitting the slopes.